I wrote about my need to become serious about my lifestyle habit changes one year ago today. It has been eight months since I began going to the gym and eating healthy as a part of my healthy lifestyle. 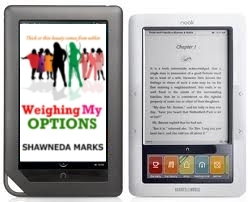 WEIGHING MY OPTIONS have written what I hope is a story some women who've struggled with obesity over an extended amount of time will find at the least entertaining on their path to wholeness. It addresses some of the issues and things I witnessed watching countless hours of weight loss television shows on Netflix, talking to friends, reading blogs on weight loss communities and in my own life. To date this is the most personal novel in my wholeness series because it addresses an area I've struggled with almost my entire life. But this story is not about me. I wrote it for you and every woman you know who has struggled with obesity. My prayer is you'll read it with a greater desire to continue on your path to wholeness. My hope is you'll see in Toney, Briana and Julie's story that no matter how much weight you need to lose or why you gained it, there is hope. My prayer is you'll see you have options. Check out the first chapter here.